Penck was born in Dresden, Germany in 1939 as Ralf Winkler. In his early teens he took painting and drawing lessons with Jürgen Böttcher, known by the pseudonym Strawalde, and joined with him to form the renegade artists’ group Erste Phalanx Nedserd (Dresden spelled backward). He later worked for a year as a trainee draftsman at the state advertising agency in Dresden. After failing to gain admission to the fine-arts academies in Dresden and East Berlin, Penck worked for several years as a stoker, a newspaper deliverer, a margarine packer and a night watchman. Penck later studied together with a group of other neo-expressionist painters in Dresden. He became one of the foremost exponents of the new figuration alongside Jörg Immendorff, Georg Baselitz and Markus Lüpertz. Under the East German communist regime, they were watched by the secret police and were considered dissidents. In the late 1970s they were included in shows in West Berlin and were seen as exponents of free speech in the East. His work was shown by major museums and galleries in the West throughout the 1980s. 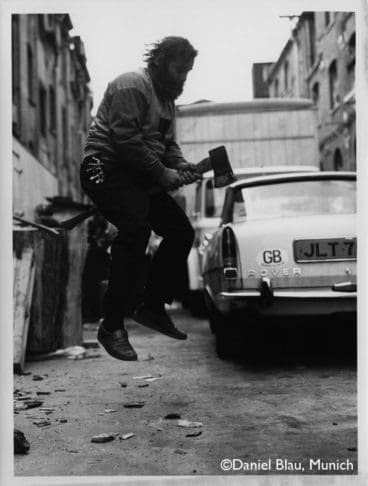 Penck first attracted attention with a series of paintings and sculptures, made in the 1960s and early 1970s, that he called Standarts, a conflation of “standard” and “art”, with an echo of the German word for banner or flag, Standarte. In the 1980s he became known worldwide for paintings with pictographic, neo-primitivist imagery of human figures and other totemic forms. Penck’s sculptures, though less familiar, evoke the same primitive themes as his paintings and drawings. They use common everyday materials such as wood, bottles, cardboard boxes, tin cans, masking tape, tinfoil, and wire, and are crudely painted and assembled.The sculptures are often reminiscent of the stone heads of Easter Island and other Oceanic art. After leaving East Germany, Penck settled in Kerpen, southwest of Cologne, but in 1983 he moved to London. He later relocated to Dublin. At the time of his death, Penck lived and worked in Berlin, Düsseldorf, Dublin and New York City. Penck died on 2 May 2017 in Zürich at the age of 77.